The official selection of Rasmus Dahlin is hours away and one of the most popular questions in Sabres Nation is who the Sabres will select with the 32nd pick. We discuss the various options for the Sabres in the second round while also touching on Mike Hoffman being shipped from Ottawa to San Jose to Florida. We also touch on Barry Trotz’s resignation and the Domi-Galchenyuk trade. The black and red era is an interesting one. On one hand you have some of the darkest times in franchise history. The Rigas scandal, bankruptcy and league control and fears of relocation. Even with that dark period at the turn of the century, those 10 years were some of the most successful in franchise history. Three Conference Finals appearances, one Stanley Cup Final, multiple playoff appearances and a few of the most memorable goals in franchise history. Despite the success it feels like this era of team history is ignored too often and as we watch another disastrous season drag to a close, it feels like a great time to rekindle the good memories from those seasons. So, after a brief hiatus when the despicably named forerunner of this event departed for greener pastures, it’s time to bring back Black and Red night at the arena. It seems fitting as the Dominik Hasek bobblehead being given away on Fan Appreciation Night is sporting the goathead jersey and colors. 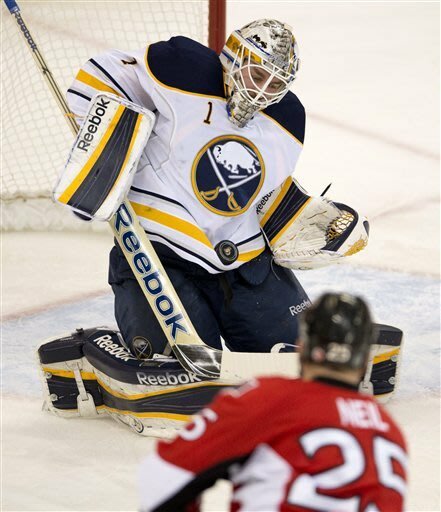 Additionally, so many of the best memories from 1996-2006 feature the Senators as the Sabres foil. Just look at the videos linked above. Plante, Dumont, Pominville all scored OT winners against the Sens. And don’t forget Bryan Smolinski’s stupid, smug face, Tim Connolly’s tying goal and Chris Drury’s winner from game one in 2006. So join in on the celebration and rock your favorite goathead or butter knives jersey at Marine Midland Arena KeyBank Center on Wednesday night. Catch Casey Mittelstadt, grab a Hasek bobblehead and enjoy the rest of what Fan Appreciation Night will have to offer. You won’t believe this but there are plenty of seats available. The Instigator Podcast 6.12 – Do the Sabres Have a Leadership Issue? Does it Matter? There have been some whispers that the Sabres may be lacking in the leadership department. Or at the very least, aren’t made of the type of players who don’t carry themselves – on and off the ice – the way players in winning organizations do. We break down whether or not that might be a plausible explanation for the Sabres struggles or if there are other factors at hand. We also take a close look at the Matt Duchene trade and how the first big blockbuster of the season will affect the teams involved. The NHL Draft has come and gone and free agency is on the horizon. The Buffalo Sabres and Tim Murray made a move with the Florida Panthers to kick off day two of the draft that evened out their defense ranks, bringing in Dmitry Kulikov and shipping out Mark Pysyk. For the third-straight season I rolled up six out of eight correct playoff series predictions in the first round. I fully expect to almost completely whiff on my second round predictions for the third-straight season. While I swung and missed on my Cup Finals prediction, I managed to guess most of the second round participants and I’ll now provide my predictions for the second round series. This will be a very interesting series to follow. The main storyline is the Penguins struggles in net but this will really come down to Pittsburgh’s firepower matching up against Craig Anderson and Ottawa’s ability to defend. Pittsburgh has a deep offensive lineup that would create ugly matchup choices for an All Star team, let alone the seventh seed in the playoffs. If Paul MacLean can work his magic and Anderson stays hot, this will be a long series. Why Pittsburgh will win: Firepower is the name of the game for the Penguins. They outscored their way to the second round with little more than average goaltending supporting their back legs. This is an offensive juggernaut which also has a pair of bottom six lines capable of mixing offense and defense quite nicely. Goaltending will obviously be an issue and the hot button issue until Tomas Vokoun proves he can carry this team. Funny how 12 months, an intense labor debate and relatively happy returns from fans can change how things work in the NHL. When realignment was brought up last season, the NHLPA shot down the proposal citing a number of issues surrounding travel and questions about the playoff format. After burning a major portion of the season to a lockout, the NHL and PA put through a realignment plan for next year that was nearly identical to the one that was vetoed last season. There are some significant changes to this plan compared to the last proposal. Both Detroit and Columbus come East, leaving the league with unbalanced conferences; a wild card option has been instituted to keep a competitive balance for the playoffs; lastly, the recently approved plan ensures every team will appear in every arena over the course of the year. 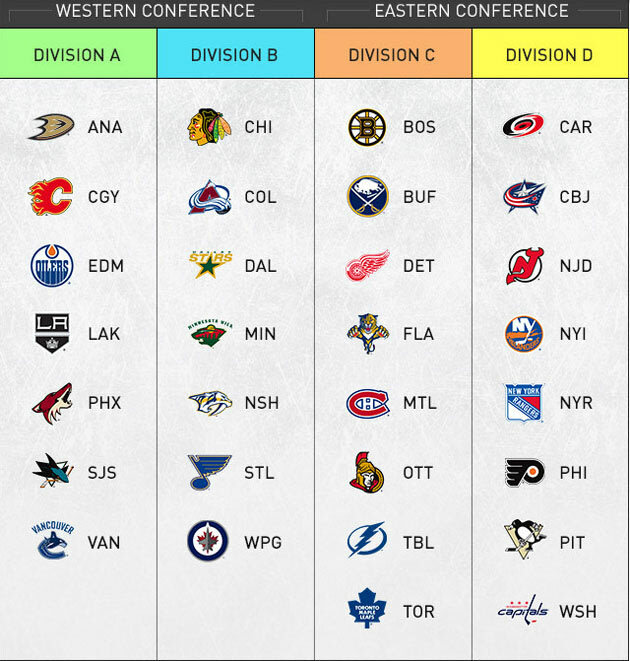 The Sabres will welcome three new division rivals to their yet-to-be-named division dubbed as “Division C” in the most recent league graphic illustrating the new conferences. In addition to their current Northeast Division rivals, the Sabres will welcome Florida, Tampa Bay and Detroit to their new division. The Bolts and Panthers ended up being the black sheep of the entire realignment as they’re geographically hamstrung compared to the rest of the Eastern Conference. Short of splitting them between the two divisions (an unrealistic option), the NHL had limited options with their two Sunshine State franchises. Detroit (along with Columbus) made good on the reported promise made by the league to get them into the Eastern Conference, away from 10:00 starts and into a division with relatively limited travel. Buffalo will play five games a year against division opponents, three games a year against the other Eastern Conference teams and 28 total against the West. While the new division alignment doesn’t stack the odds against the Sabres, it doesn’t necessarily favor them either. Finding success within their division may not be as much of a challenge for the Sabres as remaining above those teams from the other Eastern division. There isn’t all that much to sum up with the Buffalo Sabres at this point. Another game, another night allowing four goals and yet another loss. This is the same broken record that’s been playing for this entire 1-6-1 stretch. Due to injuries, Adam Pardy made his Sabres debut and Lindy Ruff also chose to get Jhonas Enroth some action although the result on the scoreboard and from those in front of the goaltender didn’t differ. A few key faceoff losses hurt the team, as did continued struggles from the special teams units. The point will be made by many that this is only 10 games worth of hockey. Others will argue that the season is almost a quarter of the way through. Regardless of which side you stand on, the glaring shortcomings on the Buffalo roster cannot be ignored. Even if it is too early to make a rash decision or trade, there needs to be some sort of remedy found for what ails this team. There were certainly Ryan Miller detractors all over Sabres Nation claiming that he was once again letting his team down and getting paid far too much money after his last few games. He was, in fact, quite average in his last couple of starts and that shouldn’t be ignored. However, after seeing another four-goal outing with a different goaltender in net, I’d hope that the lightbulb would go on for many of those fans who only see Miller as an overpaid, overrated goaltender.